Definition at line 113 of file transport.hpp. Definition at line 118 of file transport.hpp. Definition at line 146 of file transport.hpp. Transport constructor initializes static properties to invalid values. Subclass constructor must explicitly set every static property. This constructor initializes TransportState to UP; subclass constructor can rely on this default value. Definition at line 61 of file transport.cpp. Definition at line 77 of file transport.cpp. Definition at line 391 of file transport.hpp. Definition at line 397 of file transport.hpp. Definition at line 403 of file transport.hpp. Definition at line 409 of file transport.hpp. This operation is effective only if transport is in UP or DOWN state, otherwise it has no effect. The transport changes state to CLOSING, and performs cleanup procedure. The state will be changed to CLOSED when cleanup is complete, which may happen synchronously or asynchronously. Definition at line 87 of file transport.cpp. References nfd::face::CLOSING, doClose(), nfd::face::DOWN, setState(), and nfd::face::UP. Definition at line 100 of file transport.cpp. References nfd::face::DOWN, getMtu(), getState(), nfd::face::MTU_UNLIMITED, NFD_LOG_FACE_TRACE, nfd::face::TransportCounters::nOutBytes, nfd::face::TransportCounters::nOutPackets, and nfd::face::UP. Definition at line 415 of file transport.hpp. Referenced by ns3::ndn::NetDeviceTransport::NetDeviceTransport(), and nfd::face::operator<<(). Definition at line 427 of file transport.hpp. Definition at line 439 of file transport.hpp. Definition at line 451 of file transport.hpp. Referenced by nfd::face::UnicastUdpTransport::afterChangePersistency(), nfd::face::UnicastEthernetTransport::afterChangePersistency(), nfd::face::TcpTransport::handleError(), nfd::face::UnicastEthernetTransport::UnicastEthernetTransport(), and nfd::face::UnicastUdpTransport::UnicastUdpTransport(). This function serves as the external API, and invokes the protected function canChangePersistencyToImpl to perform further checks if newPersistency differs from the current persistency. Definition at line 132 of file transport.cpp. References canChangePersistencyToImpl(), ndn::nfd::FACE_PERSISTENCY_NONE, and NFD_LOG_FACE_TRACE. Definition at line 154 of file transport.cpp. References afterChangePersistency(), canChangePersistencyTo(), ndn::nfd::FACE_PERSISTENCY_NONE, and NFD_LOG_FACE_INFO. Referenced by nfd::face::InternalForwarderTransport::InternalForwarderTransport(), nfd::face::MulticastEthernetTransport::MulticastEthernetTransport(), nfd::face::MulticastUdpTransport::MulticastUdpTransport(), ns3::ndn::NetDeviceTransport::NetDeviceTransport(), ns3::ndn::NullTransport::NullTransport(), nfd::face::TcpTransport::TcpTransport(), nfd::face::UnicastEthernetTransport::UnicastEthernetTransport(), nfd::face::UnicastUdpTransport::UnicastUdpTransport(), nfd::face::UnixStreamTransport::UnixStreamTransport(), and nfd::face::WebSocketTransport::WebSocketTransport(). Definition at line 457 of file transport.hpp. This size is the maximum packet size that can be sent or received through this transport. For a datagram-based transport, this is typically the Maximum Transmission Unit (MTU), after the overhead of headers introduced by the transport has been accounted for. For a stream-based transport, this is typically unlimited (MTU_UNLIMITED). Definition at line 469 of file transport.hpp. Referenced by receive(), send(), and nfd::face::UnicastUdpTransport::UnicastUdpTransport(). Definition at line 482 of file transport.hpp. Definition at line 494 of file transport.hpp. Referenced by nfd::face::TcpTransport::afterChangePersistency(), and send(). Definition at line 500 of file transport.hpp. 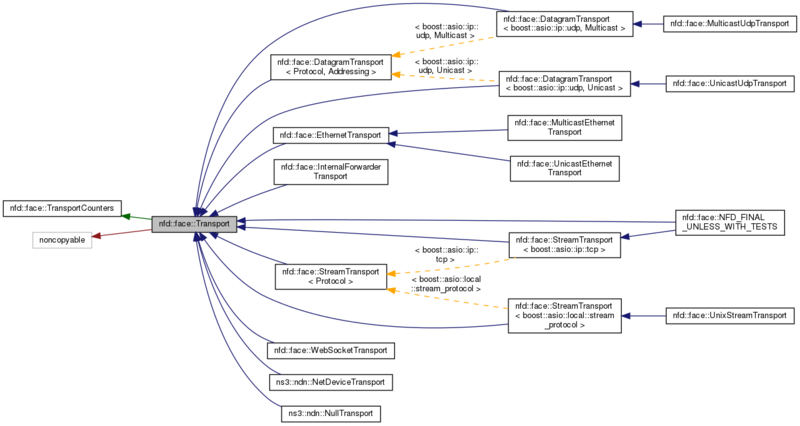 Reimplemented in nfd::face::MulticastUdpTransport, nfd::face::DatagramTransport< Protocol, Addressing >, nfd::face::DatagramTransport< boost::asio::ip::udp, Unicast >, nfd::face::DatagramTransport< boost::asio::ip::udp, Multicast >, ns3::ndn::NetDeviceTransport, nfd::face::StreamTransport< Protocol >, nfd::face::StreamTransport< boost::asio::ip::tcp >, nfd::face::StreamTransport< boost::asio::local::stream_protocol >, and nfd::face::TcpTransport. Definition at line 287 of file transport.hpp. Definition at line 120 of file transport.cpp. References getMtu(), nfd::face::MTU_UNLIMITED, nfd::face::TransportCounters::nInBytes, nfd::face::TransportCounters::nInPackets, and nfd::face::LinkService::receivePacket(). Referenced by nfd::face::InternalForwarderTransport::receiveFromLink(), nfd::face::WebSocketTransport::receiveMessage(), and nfd::face::EthernetTransport::receivePayload(). Definition at line 421 of file transport.hpp. Definition at line 433 of file transport.hpp. Definition at line 445 of file transport.hpp. Definition at line 463 of file transport.hpp. Definition at line 475 of file transport.hpp. Referenced by nfd::face::InternalForwarderTransport::InternalForwarderTransport(), nfd::face::MulticastEthernetTransport::MulticastEthernetTransport(), nfd::face::MulticastUdpTransport::MulticastUdpTransport(), ns3::ndn::NetDeviceTransport::NetDeviceTransport(), nfd::face::TcpTransport::TcpTransport(), nfd::face::UnicastEthernetTransport::UnicastEthernetTransport(), nfd::face::UnicastUdpTransport::UnicastUdpTransport(), nfd::face::UnixStreamTransport::UnixStreamTransport(), and nfd::face::WebSocketTransport::WebSocketTransport(). Definition at line 488 of file transport.hpp. Referenced by nfd::face::MulticastUdpTransport::MulticastUdpTransport(), and ns3::ndn::NetDeviceTransport::NetDeviceTransport(). Definition at line 177 of file transport.cpp. References afterStateChange, nfd::face::CLOSED, nfd::face::CLOSING, nfd::face::DOWN, nfd::face::FAILED, NFD_LOG_FACE_INFO, and nfd::face::UP. Referenced by nfd::face::TcpTransport::afterChangePersistency(), close(), nfd::face::EthernetTransport::doClose(), nfd::face::InternalForwarderTransport::doClose(), nfd::face::WebSocketTransport::doClose(), nfd::face::TcpTransport::handleError(), and nfd::face::WebSocketTransport::handlePongTimeout(). Definition at line 506 of file transport.hpp. Referenced by nfd::face::UnicastUdpTransport::afterChangePersistency(), and nfd::face::UnicastEthernetTransport::afterChangePersistency(). Reimplemented in nfd::face::TcpTransport, nfd::face::UnicastEthernetTransport, and nfd::face::UnicastUdpTransport. Definition at line 148 of file transport.cpp. Definition at line 172 of file transport.cpp. Implemented in nfd::face::WebSocketTransport, nfd::face::InternalForwarderTransport, nfd::face::DatagramTransport< Protocol, Addressing >, nfd::face::DatagramTransport< boost::asio::ip::udp, Unicast >, nfd::face::DatagramTransport< boost::asio::ip::udp, Multicast >, nfd::face::EthernetTransport, nfd::face::StreamTransport< Protocol >, nfd::face::TcpTransport, nfd::face::StreamTransport< boost::asio::ip::tcp >, and nfd::face::StreamTransport< boost::asio::local::stream_protocol >. Definition at line 274 of file transport.hpp. Referenced by nfd::face::InternalClientTransport::connectToForwarder(), and setState(). This is done to ensure the NDNLPv2 fragmentation feature functions properly. Definition at line 374 of file transport.hpp.